North part of Town of Mount Pleasant - Pleasantville. 9 Atlas rural country district north of New York City. 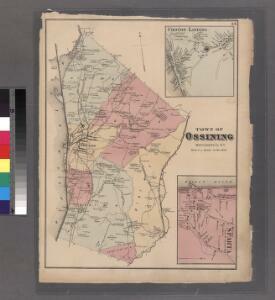 Plan of Sing Sing and part of Town of Ossining. 1 : 21600 G.W. Bromley & Co.
Westchester, Double Page Plate No. 24 [Map bounded by Underhill Rd., Hudson River] / prepared under the direction of Joseph R. Bien, from general surveys and official records. 188-189 Ossining, Briar Cliff Manor. 1 : 18000 G.W. Bromley & Co. Plate 52: Sinsing, Town of Ossining, Westchester Co.N.Y. Plates 45 & 46: Singsing, Town of Ossining, Westchester Co. N.Y.
1 : 5400 G.W. Bromley & Co. Description: from County atlas of Westchester, New York. Published by J.B. Beers & Co., assisted by S.W. Wilson and others.